The Disney Channel’s animated series Gravity Falls, isn't your average dumbed down cartoon for kids. In fact, it's so appealing to adults that it airs each week at 9:30 p.m. on Friday nights on the Disney Channel. It seems the Mouse House is expecting mom and dad to watch it live and DVR it for the kids to view during the day on the weekends. In an exclusive interview with the star of the series, Jason Ritter, he talked about his character Dipper Pines and why the show appeals to adults. 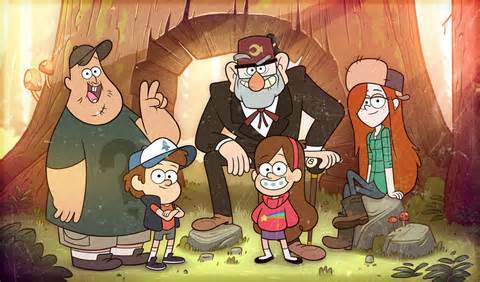 Gravity Falls follows two young twins, Dipper (played by Ritter) and Mabel (played by Kristen Schaal), who are sent to spend the summer at the home of their great uncle (aka Grunkle Stan played by Alex Hirsch) in Gravity Falls, Oregon. Ritter explains, "His parents think that Dipper and Mabel have become too used to being indoor city kids, and so they want us to experience fresh air." But things are not as they seem in Gravity Falls Grunkle Stan runs The Mystery Shack, a tourist trap featuring bizarre things. While spending the summer with their uncle, Dipper and Mabel encounter creatures in the woods and monsters in the lake and even do a bit of time traveling. Always up for an adventure, Dipper, a curious and clever 12-year-old, is overzealous when it comes to solving the mystery of the day. Mabel is his optimistic and energetic, if not slightly kooky, partner in crime. Ritter says he bears a strong resemblance to his character. "I really enjoy a good mystery. I love going on adventures. Dipper has a crush on an older girl, and I definitely remember what that was like to be in love with an impossible person." He added, "I think that the main difference between Dipper and I is that he is 12. But other than that I think we're pretty much alike." Like all offerings on the Disney Channel, the series was created with kids in mind, but Ritter pointed out why the show will appeal to parents, as well. "Usually what happens is in children's programming, they will do a bunch of jokes that are aimed towards the kids and then they'll throw in a couple of under the radar jokes for the grown-ups. And the one thing that I really liked about this show is that they don't really do that. They don't separate it out so that there's one for you and one for you. It's all just funny and strange." He continued, "To see a Gnome get kicked in the stomach and throw up a rainbow for 10 full seconds is funny to everybody. We can all laugh at that. Not if it happened to a real Gnome. I'm not condoning Gnome violence. But it's just such a strange and funny show that I think that the humor will appeal to everybody." If the humor alone is not enough to draw in the adult viewers, perhaps the cast will seal the deal. Aside from Ritter, who fans loved from Parenthood and The Event, Mabel is voiced by Kristen Schaal. She made a name for herself on shows like "Flight of he Conchords" and The Daily Show and The Last Man on Earth. Guest stars this season include Jennifer Coolidge, Will Forte, Alfred Molina, Lance Bass, Coolio, and Larry King. To learn more about Gravity Falls visit the show’s official website.